Ultrasound-guided nerve block procedures comprise discreet component tasks that when deconstructed provide a basis for teaching, learning and assessment of skills. In the motor skill learning literature, fractionization refers to practising a discreet component of a complex motor skill separately. (2) Acquiring relevant sonograms and identifying anatomical structures is a discreet component skill required for ultrasound-guided regional anaesthesia. A second key component skill is needle-guidance under ultrasound. Both sonography and needling skills can be practiced in a non-clinical environment and then combined with other skills and knowledge to perform a clinical procedure. An example of the benefits of deliberate practice is demonstrated in the following example. Ten University of Melbourne Doctor of Medicine students, all novices to ultrasound, had their sonographic proficiency assessed in a structured teaching environment. Proficiency was measured by the novices ability to acquire and interpret sonograms required for ultrasound- guided axillary brachial plexus block. 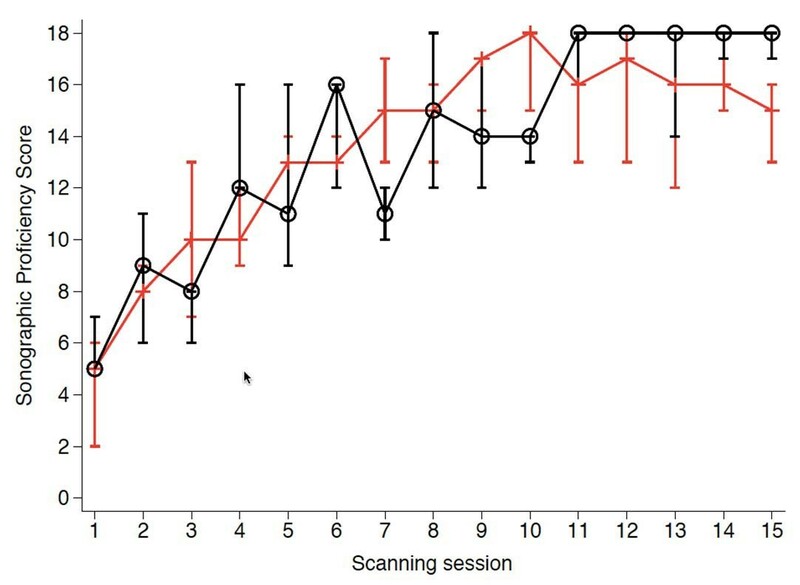 Figure 1. demonstrates that within 8 – 10 supervised scanning sessions that included feedback; novice participants achieved sonographic proficiency (maximum score possible, 18) at this anatomical site. Figure 1. Group median (and interquartile range) of ‘Sonographic Proficiency Scores’ versus Scanning Session for massed (—+—) and distributed (—[gj —) groups. 1. What is the name of the block and what is the indication for the block? 2. What are the most important anatomical landmarks? 3. What sensory and motor blockade will the block produce? 4. Assume I am the patient. Please provide me with information that I require to make an informed decision and be able to consent (or not) to this block procedure. 5. What monitoring are you going to use during the block? 6. What probe are you going to use? (If trainee states anything other than high or intermediate frequency/ linear probe, ask for further explanation). What are you going to inject and what volume and concentration? What needle type? How are you going to test the success of the block? If the block is unsuccessful (or incomplete) what are you going to do (assuming you still plan to proceed for surgery)? If the block is successful what instructions are you going to give the patient and the nurse looking after the patient, after the operation? The preoperative briefing can be used to discuss a wide range of logistical, generic clinical and hospital-specific issues relating to a particular case. Feedback given to a trainee when a procedure is completed can track back to learning objectives. a. Learning versus performance - performance of a motor skill is a measure of immediate aptitude. If a learning session leads to a sustained improvement in performance then learning has occurred. During a teaching session, improvement in a measurable aspect of a registrar’s performance does not necessarily reflect learning. For learning to occur the improvement must persist or be transferrable to other skills. b. Concurrent feedback - Feedback delivered during the performance of a skill. Concurrent feedback may be required for a novice however; if feedback is delivered during the procedure it may inhibit learning of an intermediate practitioner. In this setting concurrent feedback may represent coaching and inhibit progress towards independent practice. c. Motor skill level of trainee - recognising the level of motor skill development is helpful in determining the required level of supervision and content of feedback. Motor skill stages have behavioral and neuropsychological correlates. Ideally the pre-trained novice has reached the intermediate stage of motor skill development. At the intermediate stage there is a degree of automaticity in the learners actions. We are more relaxed, have increased confidence and efficiency improves. d. Zone of proximal development - When a registrar performs a task that is difficult enough that they require help from a tutor, it is described as being in the zone of proximal development. Tasks performed in this zone promote learning. e. Scaffolding – is a term used to describe the support given to a registrar when they are performing a task in the zone of proximal development. Scaffolding also refers to support provided to control and monitor the clinical environment so that the trainee can focus on a specific skill. f. Summary feedback – Feedback provided shortly after the procedure is completed. One method of initiating a discussion is to ask: “How do you think you performed?” Feedback should be targeted and focus on 2 -3 points including constructive feedback, positive feedback and identification of weaknesses. It is essential that regional anaesthesia is integrated into the modern paradigm of perioperative care. The modern paradigm of care includes programs such as Enhanced Recovery After Surgery (ERAS) and the Perioperative Surgical Home (PSH). The American Society of Anesthesiologists has proposed the PSH as a potential solution to the variability in both the cost and quality of perioperative care in the United States. (6) There is increasing demand to demonstrate value to patients, insurers and our patients. ERAS and PSH call for standardized, evidenced-based interdisciplinary perioperative pathways for commonly performed surgical procedures. Although PSH is likely to include ERAS pathways, the conceptual framework for PSH is more encompassing than ERAS. According to Kain, the PSH is a practice model that emphasizes superior coordination of care from the minute a decision to operate is made until 30 days after discharge. PSH aims to implement evidenced-based preoperative, intraoperative and postoperative protocols with minimal variability across an institution. Protocols will vary based on surgical services and will be tailored to the local environment. PSH will leverage data as a means to evaluate and improve all interventions in a continuous manner. Opportunities exist because of the vast amounts of information being collected from existing information technology infrastructure. (7) Length of stay and other metrics relating to cost are outcome measures that the PSH aims to collect. For example, in a total joint pathway developed for the PSH, the median length of stay for both total knee and hip arthroplasties was 3 (2-3) days, median (95% confidence interval). (6) Of relevance to our current practice is that, these results (for length of stay) were obtained without the use of regional anaesthesia techniques traditionally used by anaesthesiologists. In many scenarios, the lack of controlled trials relevant to a clinical pathway make it difficult to definitively recommend a specific technique for a pathway and often, there are several anaesthetic and analgesic options. Therefore, we may rely on consensus statements and expert opinions. As far as possible, in the PSH all therapies that the patient are exposed to will be based on evidenced-based best practice. In addition, the goal of PSH is to minimise variability within a given institution in the perioperative therapies and interventions that patients are exposed to. The PSH therefore requires development of standardized pathways for each stage of the perioperative care for commonly performed operations. In the table below are examples of components of a pathway for total joint arthroplasty. This structure contains content that is not meant to be definitive and in no way implies that there is consensus on many of the components of the pathway. The choice of technique may affect other elements of the pathway. Approaches are evolving as new techniques, equipment and drugs become available. 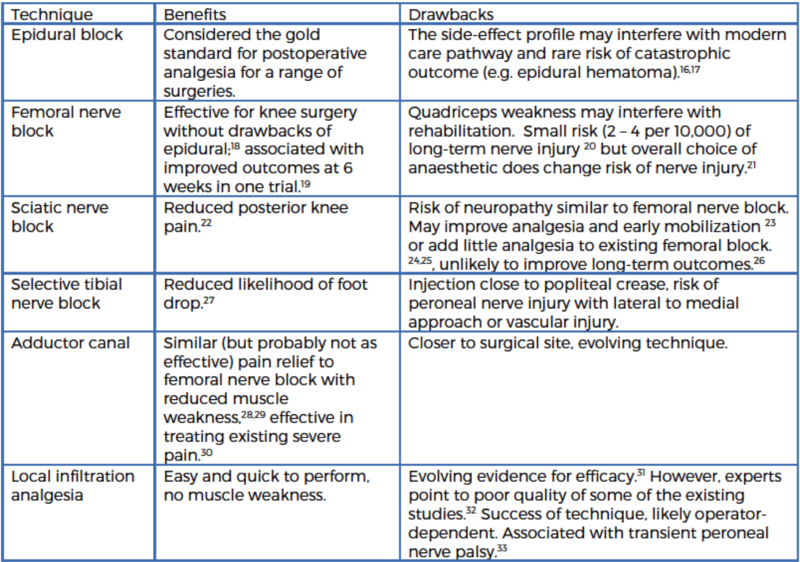 The following table lists common sites used for regional anesthesia, along with benefits and drawbacks. Other variables to consider for regional anaesthesia. Options for surgical anesthesia are summarized in the table below. Blood transfusion has risks (43) and one of the goals of the pathway may be to minimize blood loss and hence transfusion requirements. A wide variety of techniques are available to minimize blood loss, some of which are summarized in the table below. Pathways often address pain control for patients with chronic pain or opioid use, as well as those without. Generally this section will comment on both the expected infusion regimens for continuous peripheral nerve blockade, (51) as well as adjuvants such as patient control opioid administration, ketamine, or other drugs. Anaesthetic pathways need to comment upon ways in which they interact with the surgeon’s pathway, and make it clear why particular recommendations are made. 2. Schmidt R. Supplementing the Learning Experience In. In: Motor Learning and Performance - A Situation-Based Learning Approach 4th Edition. 4th edn. Champaign, IL, USA: Human Kinetics; 2008: 218 - 253.